Image caption Sir Barry said he was "enormously proud". 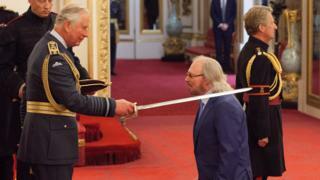 Bee Gee Sir Barry Gibb paid tribute to his late brothers as he collected his knighthood on Tuesday. Sir Barry is the last surviving member of the band after the death of Maurice following a bowel operation in 2003 and his twin Robin in 2012 from cancer. "If it was not for my brothers, I would not be here. If I had spent my whole life writing songs on my own, it would have meant something else altogether. "I hope and pray they are aware of what's happened," said Sir Barry. The 71-year-old said there is "no question" he would have loved to have shared this special day with his brothers. The singer, songwriter and producer was honoured for his services to music and charity. Sir Barry said he is still trying to get used to his new title, which he is finding "a bit surreal". He added: "It is a high award that your culture can give you and that is something I am enormously proud of." The Bee Gees are considered to be one of the most successful bands of all time - their hits include Massachusetts, Night Fever, Stayin Alive, Jive Talkin, How Deep Is Your Love, Words, Tragedy and You Win Again. They also wrote hits for artists including Barbra Streisand (Woman in Love and Guilty), Dionne Warwick (Heartbreaker and All the Love in the World), Kenny Rogers and Dolly Parton (Islands in the Stream), Celine Dion (Immortality) and Diana Ross (Chain Reaction). Not to mention Frankie Valli's Grease. Sir Barry said: "Working with Barbra Streisand and different artists has always been special for me. "I love to write for people. It is not just thinking, 'Oh, I will write a song today' but then when someone you admire asks you to write a song that is special motivation." Sir Barry and his siblings was born on the Isle of Man before his family moved to Manchester and he grew up in Australia. He is still making music and performed in the 'legends' slot at Glastonbury last year.